LONG ISLAND CITY — A Queens photographer who grew up in Dutch Kills is looking to preserve what remains of the neighborhood of his youth. Salvador Espinoza was born and raised in Dutch Kills, a section of Long Island City north of Queensboro Plaza, where he still lives. He began to notice how much the area was changing, he said, when he moved to Sunnyside for a few years around 2007. "I'd come back to visit my mother, who was still there, and each time I would come a building would be destroyed or another hotel would go up," said Espinoza, 34. "I just kind of wanted to capture people in the neighborhood, the landscape of it, before it completely changed." His photographs, taken in the past six months or so, will go on display starting this weekend at co-working space QNS Collective, in an exhibit called "We Will Be Here," which looks to capture the development of the area. The show, funded with a grant from Queens Council on the Arts, includes about 13 images as well as a collage of photos of the neighborhood. They include portraits of residents in their homes, or in front of the houses where they once lived. One image captures a larger new development looming over some of the older, small-scale buildings. "I kind of wanted to preserve some of it," the photographer said. Espinoza, who was born in 1980, described Dutch Kills as a "small community," when he was growing up there. "It was mostly an industrial area, a lot of warehouses, but there were also many homes," he said. "Small shops, small grocery shops. It was really a small community where everyone sort of knew each other through civic associations and through schools." The neighborhood became a hotspot for new hotels in more recent years, according to the New York Times, and then was rezoned in 2008, when the city lifted restrictions on residential building. "Now it's sort of changed," Espinoza said. "It's mostly tourists now that are walking around the neighborhood." 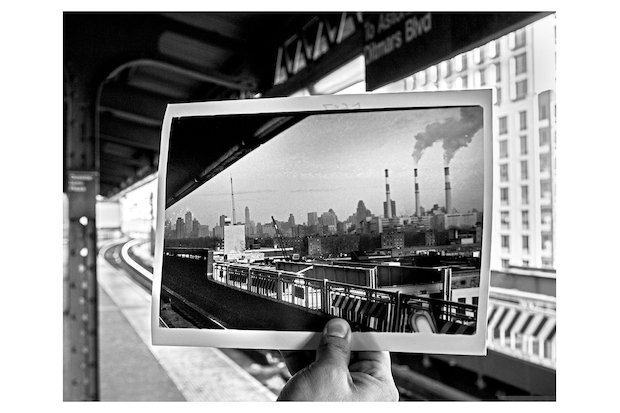 He plans to make "We Will Be Here," on ongoing project, where he'll continue to photograph the area, but is also asking current and former Dutch Kills residents to submit their old photos of the neighborhood. They can also sign up to be in a portrait, he said. "I think it would be great to kind of put that all together and sort of make a document on Dutch Kills before it changed over," he said. "We Will Be Here" opens Jan. 17, at QNS Collective at 36-27 36th St. in Astoria. A free opening reception will take place from 7 to 10 p.m.; RSVP here. The photos will be on display for three weeks. For more information email wewillbehereproject@gmail.com.